Visual Trading Console (Multi Terminal version) is a forex trade management application offering true automated multi-terminal trade management functions. Up to 10 Metatrader accounts can be monitored simultaneously. Most importantly, the software works seamlessly and transparently with Metatrader additionally offering many exciting features. The trade management module is completely customizable. Above all, it works on a “per ticket” basis! 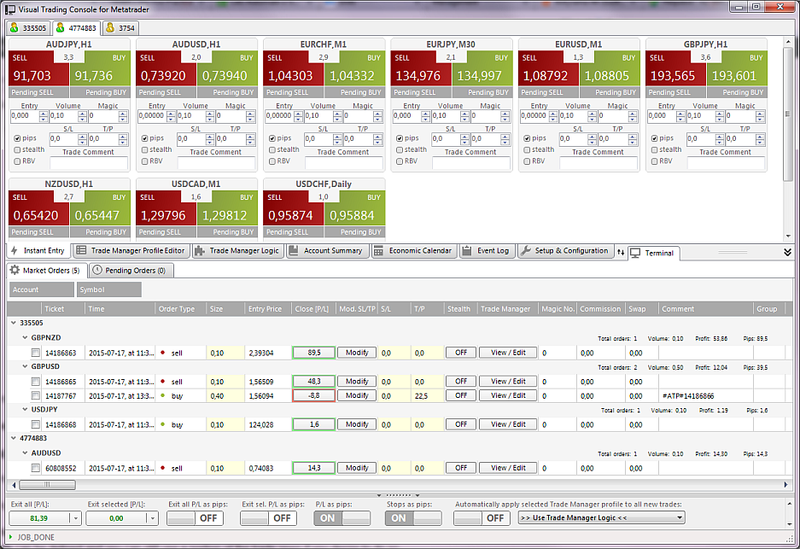 For that reason, the software is handling each trade separately, even if other trades on the same currency pair exist. Coexisting EAs and manually entered trades do not interfere with the system. The trade manager will not interfere with trades from external sources unless instructed otherwise. Trading is conducted either from order entry boxes on the application’s “instant entry” tab, via standard MT4 interface or on VTC’s floating order entry panel – an indicator attached to any MT4 chart. The panel is a mirror of the order entry panel that is visible in VTC’s Instant Entry tab. Furthermore, you can reposition it on the chart or minify it to suit your preference. With this feature, VTC is convenient for use even on a single computer screen. Therefore it is also a great tool for scalpers, that need to keep focused on the charts at all times. Initial Stop Loss and Take Profit levels, defined in pips or price value. 12 different trailing stop types activated at user-defined profit levels. Stepping stops with up to 5 different levels where stops are advanced by a given amount of pips or set to a predefined price level. Multi-level profit taking designed to scale out of a position at given levels by a percentage of the open trade. Trades can be scaled out on up to 5 levels. A portion of the trade can additionally be left open if needed. Multi-level stop loss is designed to scale out a losing trade. You can utilize any of the five available stop levels. Moving your stop to break even plus an optional additional amount of pips, at a certain level of profit or loss. Robust Add to Position schema offers 10 threshold levels of settings. All with optional break even+ parameter for each individual entry. Optionally copy your SL & TP levels for the added positions or specify them explicitly for each added position. These levels can be used for adding positions when in profit or similarly cost averaging losing trades. Selected trades can be closed at a specified time using the Timed Stop feature. Also, a given trade duration can be specified to close a trade. Lastly, a trade can simply be closed after a preset number of bars. It is most noteworthy, that using all these features together enables you to set up even the most advanced trade management strategy for your trades. Furthermore, your settings can be stored under personalized profile names for later use. Hance, scalpers can choose to have trade manager profiles instantly applied to selected trades. All this combined with, direct from the charts, “one-click” trading plus on-chart visual stop modification make trade management a flash. Click here to find out more about the powerful trade manager module. The application can be installed & used on a VPS. It simplifies monitoring, managing, and gives better control over your trades via the use of context-sensitive toolbars. A simple click of a button enables viewing floating profit and stops in pips or price values! Easily close all trades on selected metatrader accounts or across all managed accounts via “one-click” functionality. Easily delete pending orders or group them as OCO orders. When an order from the OCO group is triggered, consequently the remaining orders in the group are automatically canceled! Follow your trading plan with easy access to weekly trading statistics. The software is compatible with all brokers. Also with all of the latest MT4 builds. Finally, all updates are free. Provided automatically via built-in automated update checking! Most importantly the console provides a wide array of features aimed to simplify the opening and closing of trades and above all, managing them more efficiently on the Metatrader platform. Please read the Visual Trading Console Multi Terminal manual articles for more information on its features. Download the FREE 30-day trial version of the Visual Trading Console. Simply clicking the button below. VTC multi-terminal software is compatible with any computer running the Windows operating system with Microsoft’s .NET 4.5.1 framework installed. The trade manager modules are all written in high performace C++. Windows Vista powered by a Pentium Dual Core processor with 2 GB of RAM is the minimum configuration for version 2.x of the software.